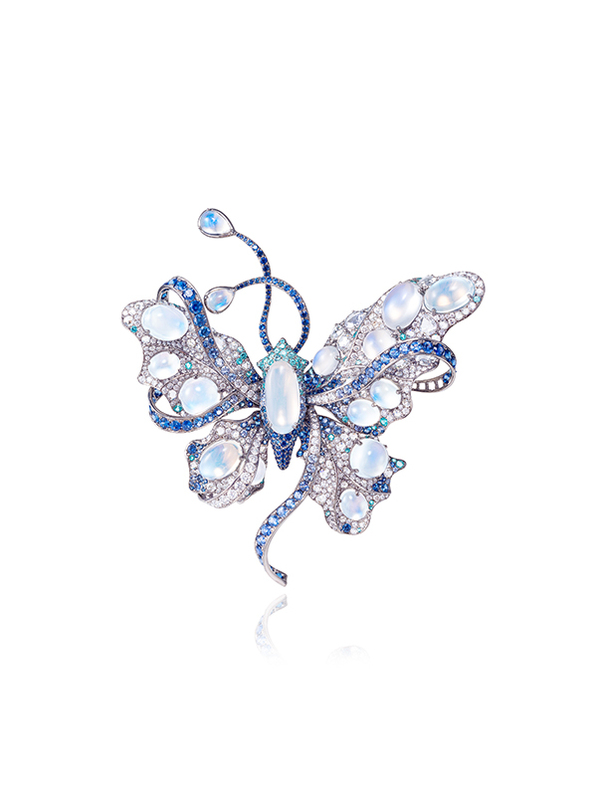 The Paris Biennale is first and foremost a show of the very best art and antiques, in which collectors’ piece jewellery plays an important part. 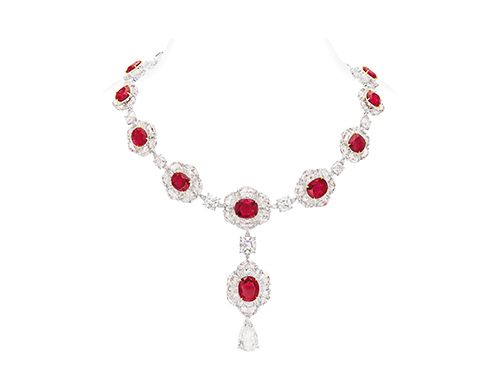 Over the years big jewellery houses found it a good platform to launch new, unique pieces with extraordinary stones and these became one of the main attractions of the public Fair. 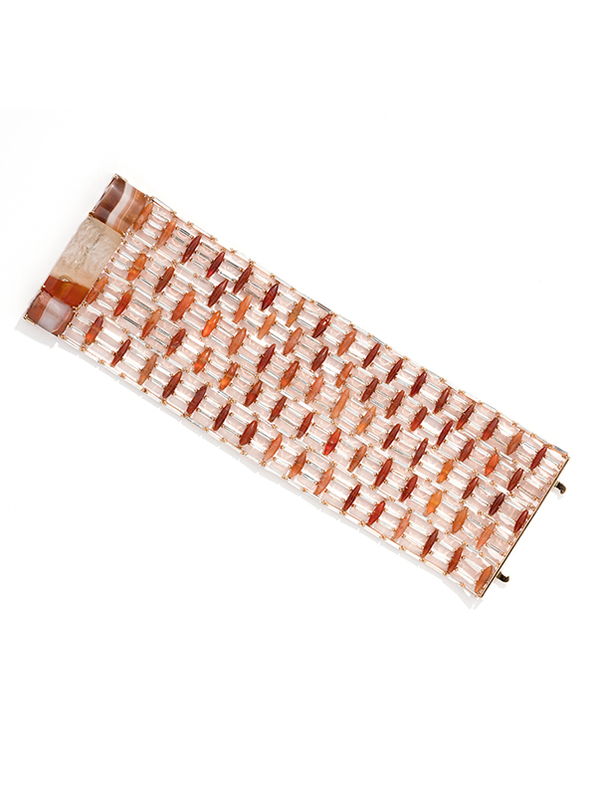 Last year the Fair returned to its roots, placing emphasis on smaller, more individual houses, and the five jewellers exhibiting this year (the Biennale is now annual) all showed signature craftwork and some very special stones. 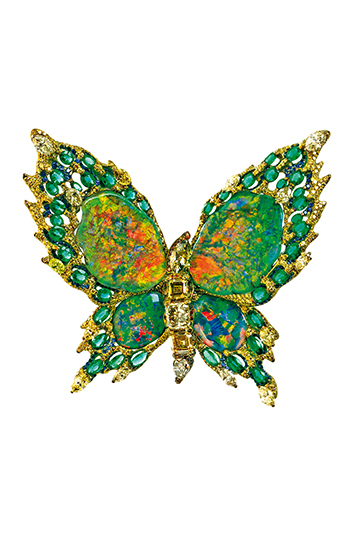 Moussaieff is noted for its ability to source unusual, large stones and did not disappoint, with luminous opals the centrepieces of a stunning diamond peacock feather necklace and a glowing butterfly pin. 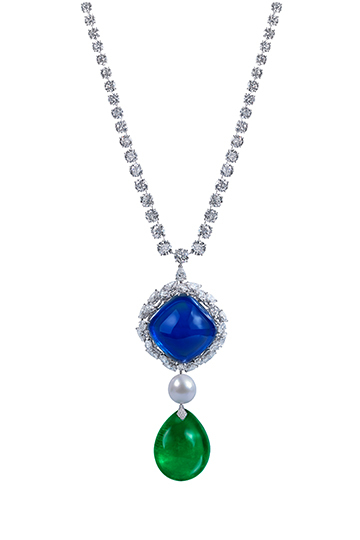 It also showed two star stones in one pendant, a huge emerald pear-shaped cabochon, separated by a very large pearl from the 140-plus carat sugarloaf sapphire above. 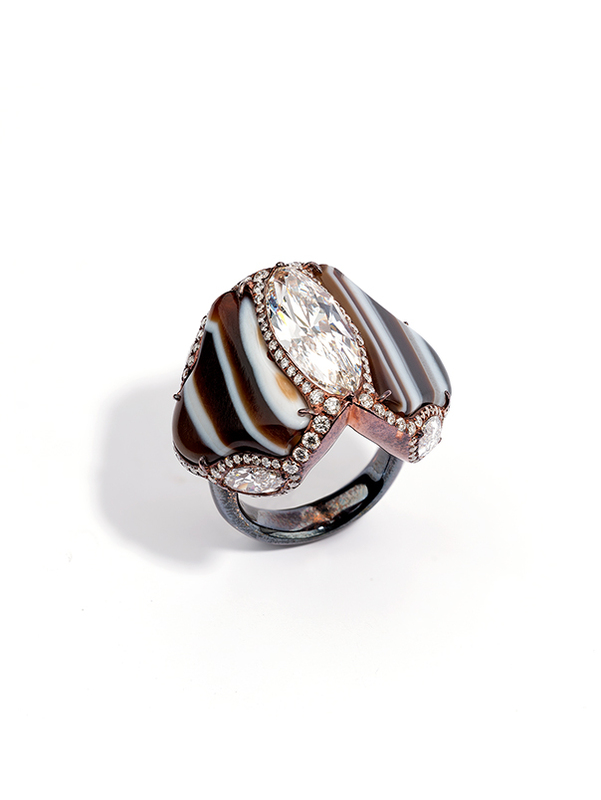 Each stone is detachable. 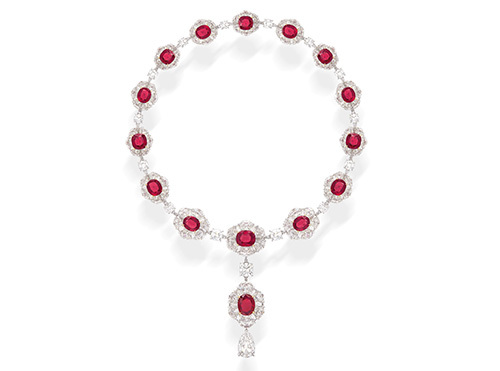 Boghossian reminded clients of both its own heritage and that of the Fair with a display of vintage jewels from its own Foundation in Brussels. 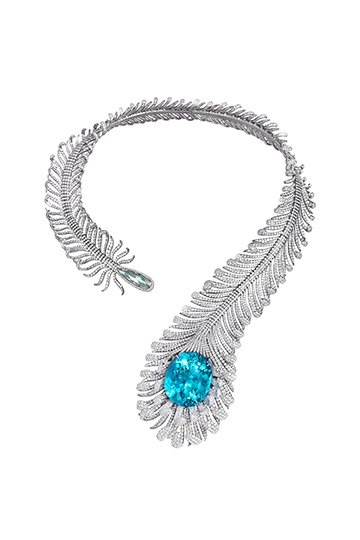 The craft of inlay work that it pioneered was evident in many pieces, not least a beautiful necklace in vivid cerulean blue, African Paraiba-style tourmalines and diamonds, inlaid into Chalcedony trimmed with turquoise. 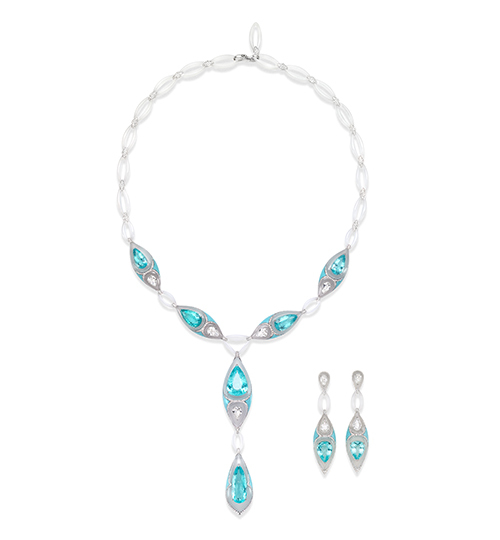 Inlaid earrings featured green beryls while a necklace of “kissing” diamonds had a soft yet modern design. 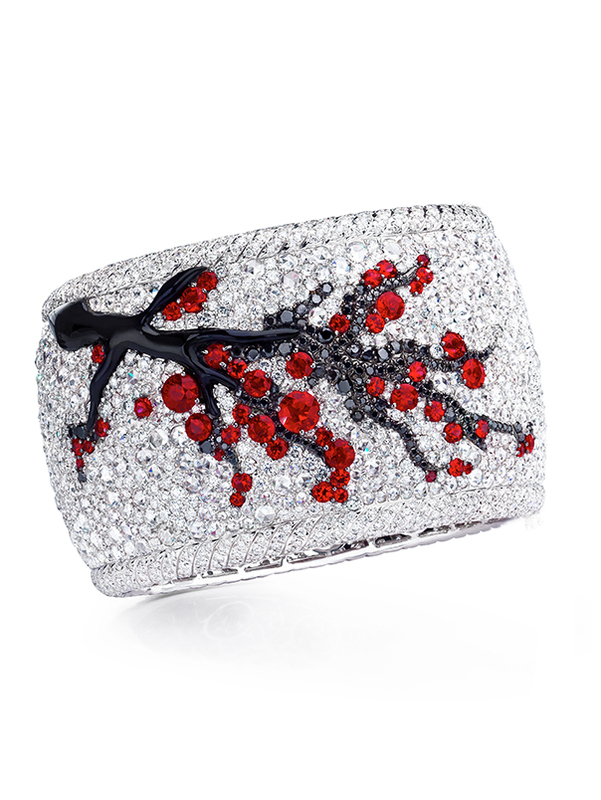 Nirav Modi is an Indian designer making waves in the west with his super light diamond settings where the metal is all but invisible and the cuts are often his own, and collections of special stones, this time a pigeon’s blood ruby necklace where the stones took years to collect, and a textured cuff of diamond flowers centred by rare, large pink diamonds. 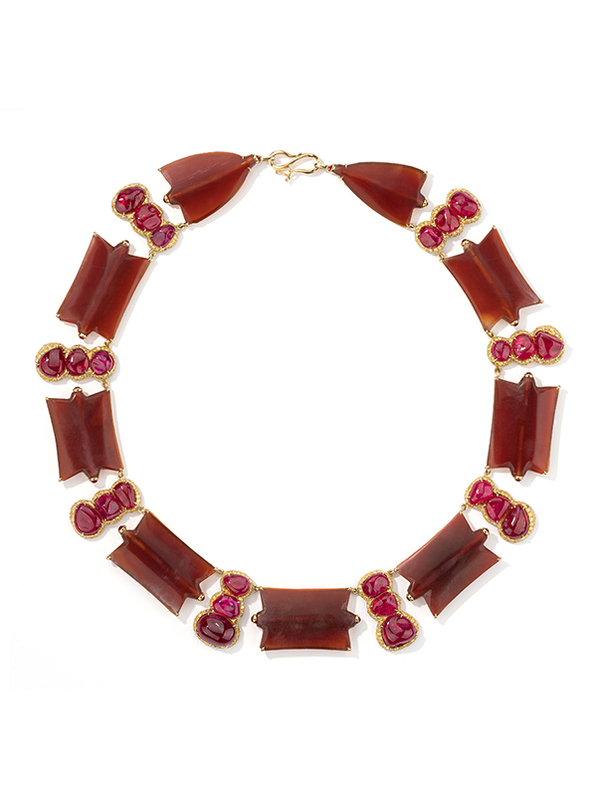 Perhaps the most unusual work came from first time exhibitor Glenn Spiro, whose use of ancient materials, such as Mesopotamian agate and carnelian, or ancient Chinese gold leaf tissue, placed in modern designs, created stunning collector’s pieces. 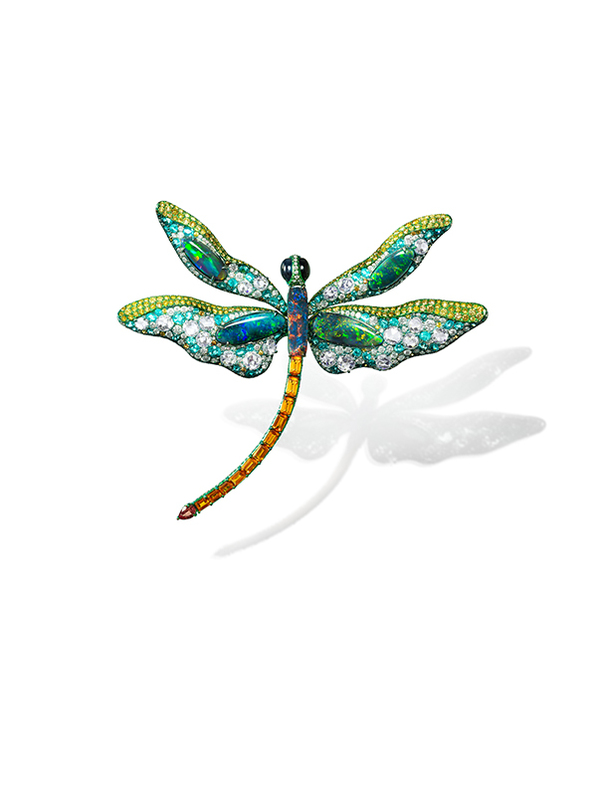 Finally, Anna Hu mixes Chinese jewellery craft with designs that have universal appeal to lovers of bold jewels – her dragonflies and butterflies set with opals or moonstones are cases in point, as is a wonderful cuff of diamonds with ruby cherry blossom. 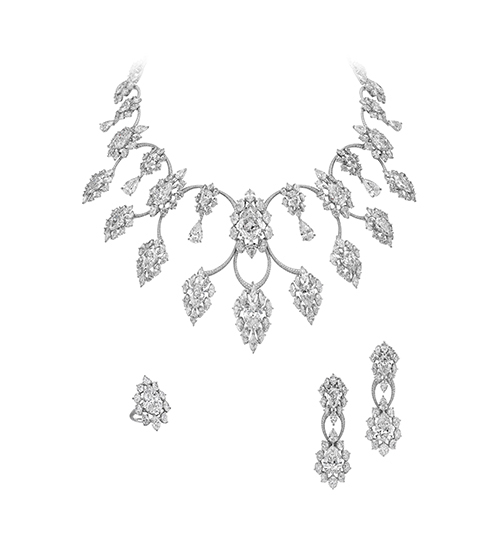 Hu says all her jewels are for wearing – “a woman’s beauty is the canvas”, she says, “but my jewels are the painting”. An opposite comment for an inspiring show.